Born in Houston, Texas and raised in Fresno, California, Jeanie Tracy’s singing career began from a very early age in her local church choir. Her infatuation for music led her to study opera in high school and to take piano lessons. She cites her high school music teacher as the person who told her she would have a wonderful future in music…and she was right! Aretha Franklin, Patti Labelle, Celine Dion, Santana and numerous other artists have called upon her immense talents to participate on their projects. Jeanie took up acting and starred in the musical “Slave Driver” by Oscar Brown who is a very reputable person in theatre life. This wasn’t the first play that Jeanie stared in however it was the first time she felt very honoured to be included because in her own words, “Oscar was the ultimate in theatre”. Furthering her acting career, Jeanie took part in “Sing Mahlia Sing opposite, and eventually filling in for, Jennifer Holliday, “Right Mind” found Jeanie staring along side veteran actors and actresses including some who were in “The Wiz”. Getting back to the music scene, Jeanie met veteran Harvey Fuqua and began writing & producing for his gospel group, Voices of Harmony. Shortly after, Harvey persuaded Jeanie to audition for the glamorous Sylvester and was thrust into the disco spotlight. Not only did Jeanie sing on his studio recordings but also in his live show! 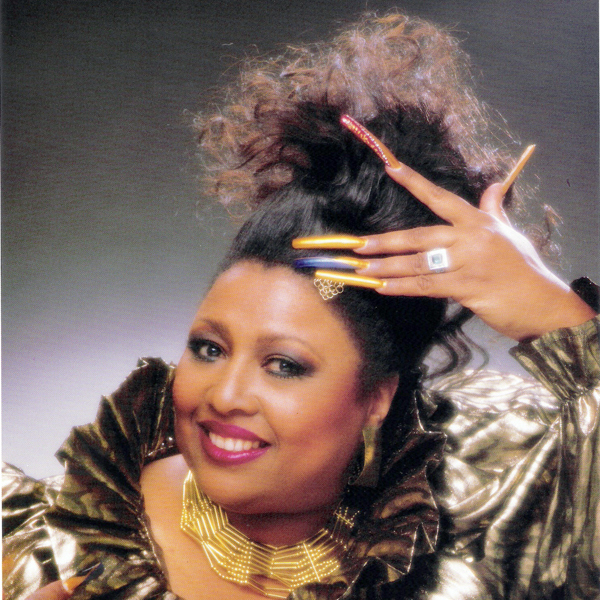 She very quickly found friendship with Sylvester and his then back-up singers, Martha Wash and Izora Armstead who had already been recording with Sylvester as “Two Tons Of Fun”. Working with Sylvester opened the door for Jeanie to begin her own solo career. Her first album, “Me and You” was released on the Fantasy Label and found her working once again with Harvey Fuqua. “Me and You” saw Jeanie’s music growing in a new direction. For the most part, the LP featured a softer, more R&B sound which helped her number of fans to swell to an even larger number. Returning the favour, Sylvester appeared in all his glory on “I’m Your Jeanie” – the biggest single from the album – with his remarkable low voice on background vocals. Jeanie appeared on Star Search and placed number one in the Female Vocalist Category for an astounding six weeks. Her Star Search wins made her a household name instantly around the world. After Sylvester’s untimely death in 1988, Jeanie decided to put her recording career on the backburner favoring the idea of doing more theater and session work. This break wouldn’t last for long and soon Jeanie was back in action flying to New York City to work with her friend, Martha Wash. While there, she recorded the track “It’s My Time” for 3-Beat Records, a U.K. based label. The track’s lyrics of say it best of the way Jeanie was feeling at the moment. “It’s my time to live again, it’s my time to stand up and shout’. Another U.K. label, Pulse-8, requested for Jeanie to record an entire album so she took a trip to London and spent 3 months in a studio, working with the song writing team Band Of Gypsies. “Do You Believe In The Wonder” and “If This Is Love” both were issued as singles and “It’s My Time” was remixed and re-released. The full length album, “It’s My Time” was then released and produced two more singles. The first, “It’s A Man’s Man’s World”, teamed Jeanie with Bobby Womack and the last single, “Crying In My Sleep”, was a ballad where Jeanie had a chance to belt out. Since the release of “It’s My Time” Jeanie has recorded a fair number of commercials and participated on numerous albums for people like Curtis Mayfield, Celine Dion, Michael Bolton, Tevin Campbell, Kenny Loggins, and Natalie Cole to name a few. Recently Jeanie moved effortless back into another form of theatre – television. She became the voice of “Kimmie The Cat” and “Bantu The Snake” on the critically acclaimed P.B.S. children’s series “Kangaroddy”. These roles allowed Jeanie to really speak from her heart and to encourage children to have respect for themselves and for others. Something she stresses for all people to do a little more of. Continuing her recording career at the same time has proved to be time consuming however it’s something that Jeanie strives on with because of her love for music. She has recorded the singles, “Happiness” on DeConstruction U.K., “Can’t Take My Eyes Off of You”, “Keep The Party Jumpin'” and the #1 Billboard Dance hit “The Power” with Rosabel which can be heard on clubfloors throughout the world! Those who have met Jeanie have said that she is a truly positive person who will captivate your attention with her energy! She herself has said that she can be a little flamboyant…a flamboyancy that generates good feelings and good times around her. What’s in store for Jeanie? Only time will tell. One thing that is for sure is that we will definitely be hearing a lot more of Miss Tracy and we won’t be able to take our eyes off of her!